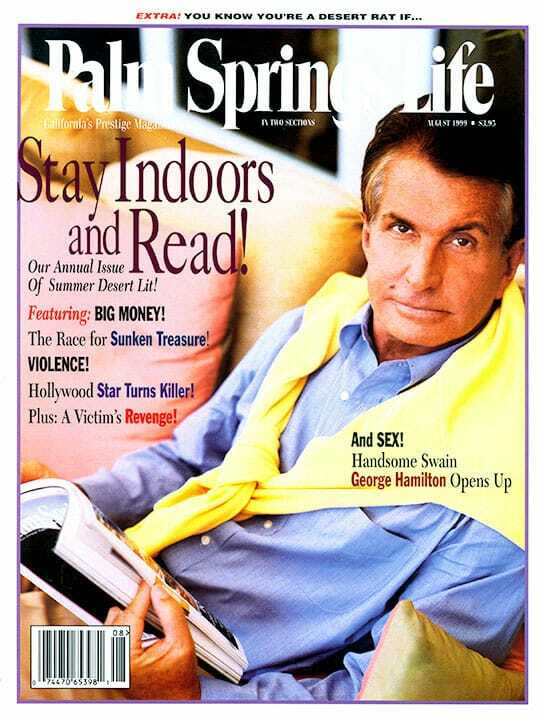 ON THE COVER — Sitting poolside at his posh eponymous Indian Wells restaurant, George Hamilton catches up on the good reads in Palm Springs Life. The China blue shirt is by Ralph Lauren; the tan slacks by Brioni, both from Saks Fifth Avenue. 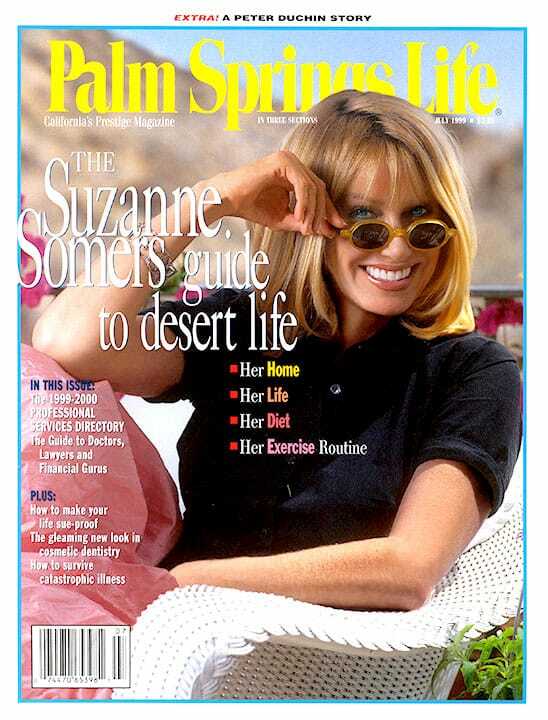 The yellow cashmere sweater is from Sulka of Beverly Hills. Mr. Hamilton was photographed by Richard Reinsdorf/Winston West. The clothing was styled by George Blodwell of Cloutier, Los Angeles. Hair and Makeup by Diana Schmidtke of Celestine. By Howard Johns. Photography by Richard Reinsdorf/Winston West. Happy-go-lucky actor George Hamilton is sitting pretty these days: His popular new restaurant in Indian Wells is just one of his successful enterprises. Come see what else is hopping with this easygoing star. By Brian Skoloff. Photography by Ethan Kaminsky. Local restaurateur Sherman Harris plunked down six grand a few years ago and invested in a sunken boat thought to contain treasure. Is his ship about to come in? In his search for fame, Tom Neal made some pretty icky career choices. 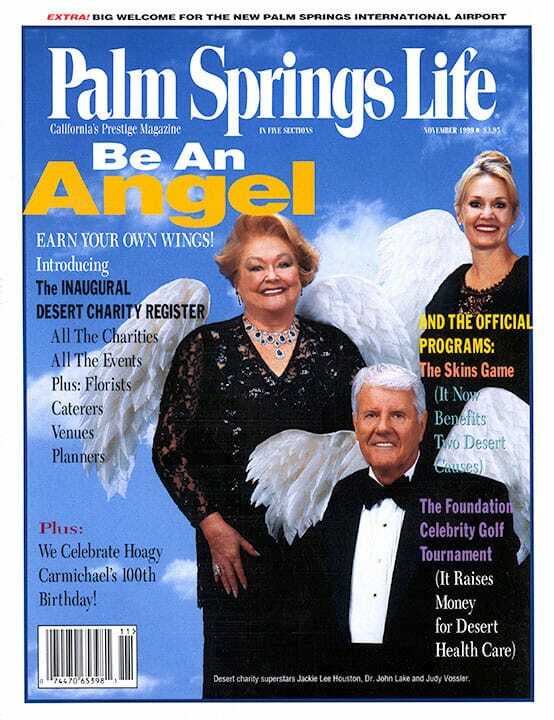 A classic Palm Springs murder mystery. Read the first-prize winner in The 1999 Palm Springs Writers Guild Short Story Contest. Not for the squeamish. Heading to Santa Fe, New Mexico, as any sensible desert resident might this month? Why, whatever will your wear? Hear are some great fashion ideas.